It’s hard to believe that your 6 year old girl is now in First Grade! She will be learning to read aloud, write stories, count up to 200, count backwards, understand odd and even numbers, and so much more. Her attention span is longer and she will be able to remember the words and melodies to her favorite songs. She will be more confident and enjoy showing off all the new things she is learning to do. Even though she is learning more and become quite independent, she will continue to ask lots of questions. And her levels of energy will still keep you on your toes! While she will be developing intellectually, her creativity and adventurous nature will continue to expand, as will her strong desire to continually try out new things. We’ve taken all this into account when handpicking our list of the best toys for 6 year old girls, so that our selections provide excitement, adventure, imaginary play, creative fun, high engagement and so much more. If your little girl is a fan of Shopkins, then she is going to want to collect as many of these little toys as possible. Shopkins are miniature household and other themed items that are made in cute tiny characters each with their own name and personality. This Shopkins Season 5 12-pack is the perfect way to add to your 6 year old’s collection. There are a number of different season five 12 packs for your child to choose from. Each set comes with 10 visible Shopkins, and 2 Shopkins that are hidden in backpacks for an extra surprise. Each set also comes with a special glow in the dark character. There are also two bonus charms that your child can put on a bracelet or necklace. Different sets cover music, sport, tiny toys and more for a total of 140 different Shopkins in all, if you purchase all of the sets. 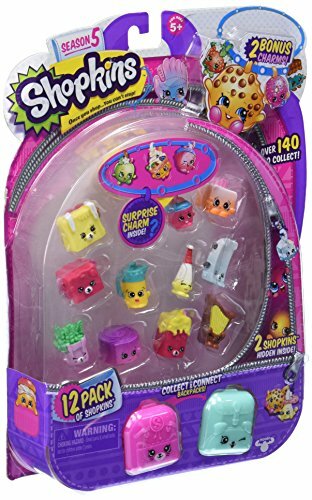 Kids love the fact that they can put these Shopkins on pencils! If you are looking for a large and sturdy dollhouse for your little six year old girl, then this KidKraft Beachfront Mansion With Furniture may be just what you are looking for. This playhouse is made from wood, and when fully built, stands 4 feet high and has a storage space at the bottom of the house with 2 sliding doors. The Mansion features 4 large rooms and comes with 14 pieces of furniture. It has a plastic staircase, a cloth canopy, an elevator and an outdoor patio. The toilet that comes with the furniture makes a flushing sound and the living room light really lights. This Mansion fits dolls that are 12 inches high. Your little girl will love the brightly colored rooms, decorated with wallpaper, paneling, tiles and other styles of decor. 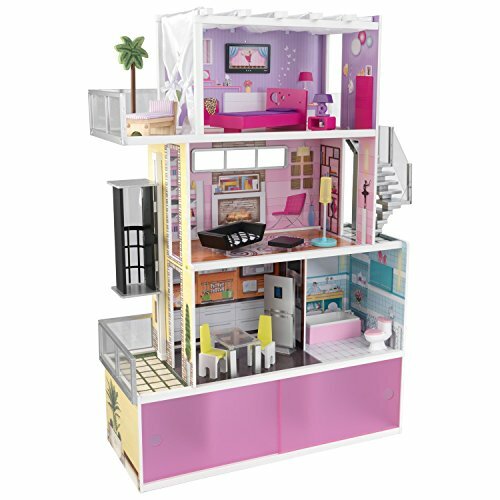 She will be able to use any if her 12 inch dolls with this gorgeous dollhouse and she can store them, along with other toys, in the storage space beneath the first floor. What fun she and her friends will have moving the elevator between floors and having their dolls climb the staircase to sunbathe on the lounger or take a nap. It’s worth noting that it does take 3 to 4 hours to assemble, but parents find that the directions for assembly are clear and easy to follow. While one person can assemble this doll house, it is helpful if two people assemble it together. And most parents said that the time taken to put it together was well worth the smile it put on their daughter’s face! Very versatile, as kids use it when playing with lots of different toys such as Shopkins characters, toys cars and truck that they enjoy parking in the garage and so much more! 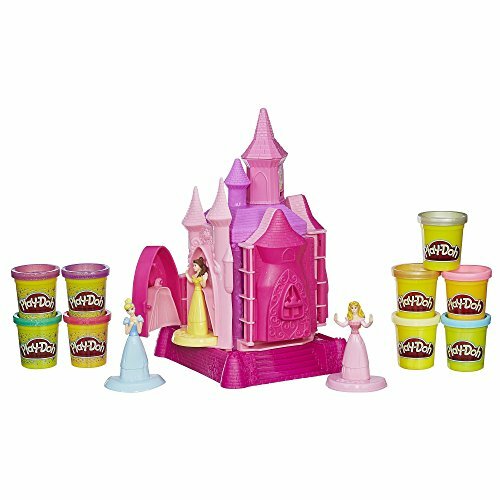 Any 6 year old who loves Princesses will love this Play-Doh Disney Princess Prettiest Princess Castle Set. The castle itself is both a mold machine and opens into a ballroom for complete imaginative play. The sides of the castle has book-like molds that each Princess fits inside of, as well as a Prince door mold. Your little girl can also make different accessories such as Rapunzels hair, roses, and glass slippers. This Castle set comes with 3 Princesses – Aurora, Bell and Cinderella – a built-in tower press and instructions. It also comes with 6 cans of Play-Doh – one with sparkle compound that shimmers, because no real Princess would be caught dead without a little bling! Now your little Princess can become a Fairy Godmother and dress her three Princesses for the ball and then have fun allowing them to dance the night away in their lovely creative costumes. Most children have fun adding bows, polka dots, and other ornaments to the ball gowns. If your child is even more creative, then she can even use small beads or faux jewels to add to the gowns as well. This magical Princess Castle Set will make a great gift for any young lady who loves Disney Princesses, storytelling and playing dress up. This Play-Doh set offers hours of imaginative play since your child create their own Princesses, make and decorate their ball gowns, turn the castle into a ballroom and so much more! 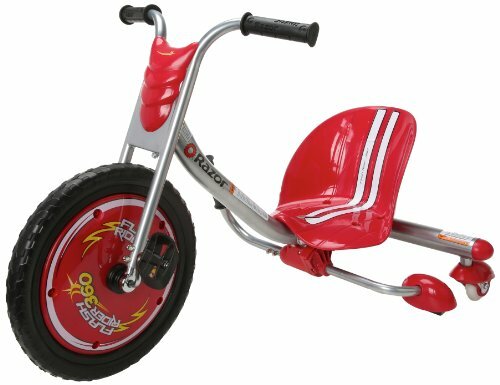 The incredible Razor Flashrider 360 in bright red is so popular with 6 year old girls and boys that we have included it on both those lists! Girls absolutely love riding it! They love being able to go fast, spin it in circles and create trails of sparks, just like the boys! Wonderful for helping your little girl make new friends if she’s shy, as all the neighborhood kids will want to try it! 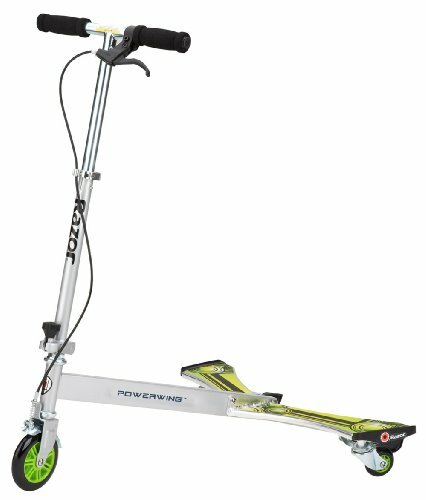 The Razor PowerWing DLX Caster Scooter is a fantastic three wheel scooter with a larger front wheel, two smaller back wheels and a hand brake that your little girl will love! She controls the speed of this scooter by how fast she twists her body. It has a divided foot deck for two feet operation and once your little girl push off, it continues to go by twisting her body. To add to the fun, she will be able to perform kickouts, side drifts and spin outs to impress all her family and friends! These scooters come in both a smaller and larger version. The handbar is adjustable and comes with foam hand grips. This scooter holds a maximum weight of 143 pounds and also folds for easy transport and storage. Because it allows your child to do a number of different tricks, she will be more likely to play with it on a regular basis and won’t become bored. The DLX comes in silver, sweet pea and blue and is the perfect gift for any occasion for your little 6 year old. 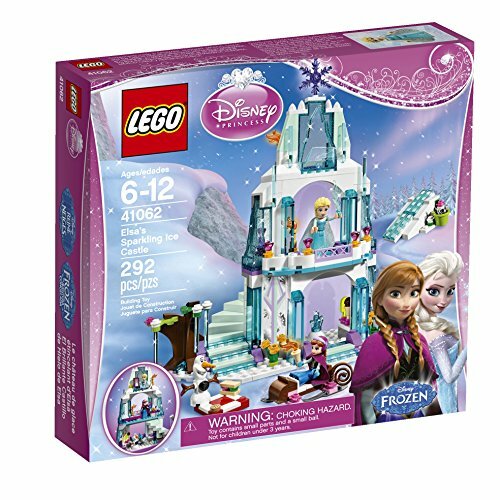 If your little girl loves Frozen then she will be thrilled to receive the LEGO Disney Princess Elsa’s Sparkling Ice Castle. This LEGO set comes with 292 pieces and consists of blocks to build a castle, an icycle tree, sleigh, secret staircase, bed and Ice hill. It also comes with loads of accessories such as skis, ice skates, stickers, capes, tiara, carrot nose for Olaf, hair bow, a picnic torches gems and more. And of course, your little princess will get Lego characters for Elsa, Anna and Olaf. When this castle is completely build it is over 9 inches tall and it will provide hours of imaginative play for your little girl. As a Frozen fan, she most likely knows the story backwards and this gorgeous LEGO Ice Castle set will allow her to re-enact every single scene. Or she might actually prefer to create some new adventures for Elsa and the gang! Whatever your little girl’s preference, she’s going to have a ton of fun building with this beautiful LEGO set, either on her own, or with family or friends. If your little girl likes dolls and has one or more of her own, then you know how much she enjoys combing or brushing their hair and changing their clothes. 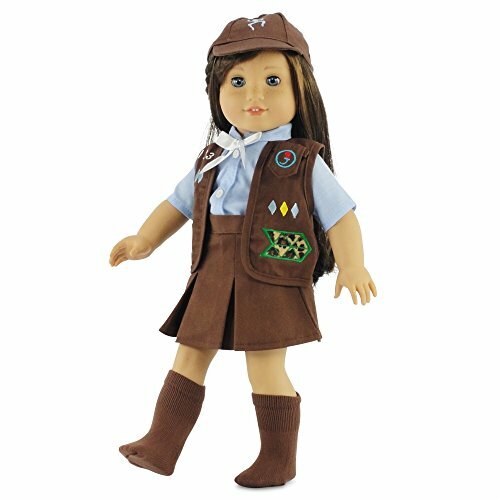 Now if she’s in the Brownies and would love to have a matching outfit for her favorite 18 inch doll, then this super cute 5 piece Brownie Girl’s Club Outfit would be perfect! This gorgeous Brownie outfit comes with a brown hat, vest with badges, skirt, socks and a blue blouse with a white tie. It’s designed to fit all soft bodied 18 inch dolls, such as the American Girl Dolls, Our Generation, Madame Alexander etc., and it is easy for your 6 year old daughter to put on and take off of her doll. Being in the Brownies Girl Scouts, your little princess is learning new skills, expanding her circle of friends, exploring the outdoors and nature, doing good in the community and earning badges. What better way to make the experience even more fulfilling for her than getting her this wonderful Brownies Outfit for her doll! Can’t you just see the look of joy on her face! It’s made with top quality material and is machine washable and comes in a beautiful Emily Rose Pink Gift Box. The Emily Rose Company took great pains to make this Brownie outfit as realistic as possible. Several Moms said that the color of this outfit exactly matches the color of their daughter’s own Brownie outfit! Your little girl can dress up her favorite doll to attend Brownie meetings with her and take part in the same activities. How cool is that! 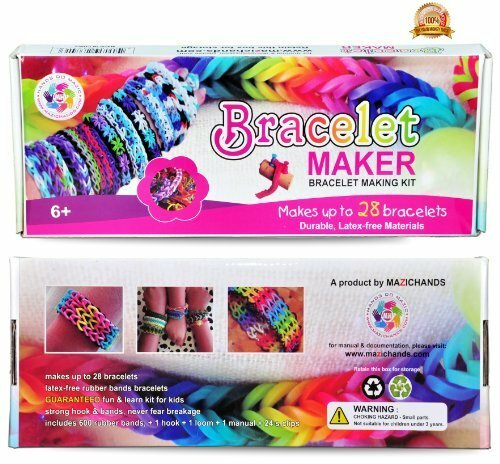 With this awesome Mazichands Bracelet Making Kit your child will be able to make friendship bracelets, necklaces, rings and lots more! This kit will allow your fashion conscious girl make up to 28 bracelets, depending on her style. It includes 24 c-clips, a loom, 600 mixed colored rubber bands, an extra strong hook, a bracelet-making manual, and FREE access to beginner videos and tutorials. Your little girl can use this wonderful kit to create her own jewelry, as well as make jewelry to give to her friends and family members. Wonderful arts and crafts toy for your child to play with on her own for hours on end, or have her siblings or friends share the experience with her for added fun and excitement. The sense of achievement your princess will get when she creates her very first bracelet will be priceless. Her face will light up with joy as she shares her new creation with you. This bracelet making kit is perfect for little girls 6 years old and up. Although this kit is sold primarily for girls, several parents said that that bought it for their boys who enjoyed making some of these bracelets (and receiving them) as much as girls do. Kit makes a great craft project for children of all genders to do together. 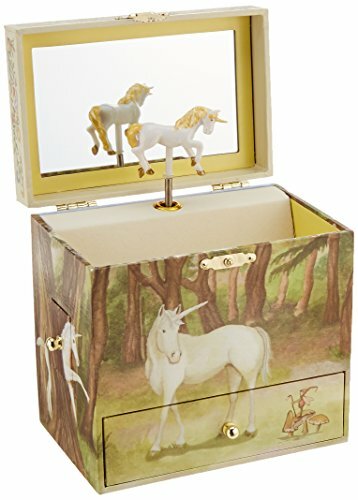 This adorable Enchanted Unicorn Music Box is the perfect first jewelry box for your little girl especially if she loves unicorns as the music box is covered in a beautiful fantasy unicorn scene. There is a tiny fairy in the drawing as well. Perfect for holding small pieces of jewelry or little treasures, this 6” X 4” X 6” music box has a large drawer in the front and back, and a small drawer on each side of the box. There is also a compartment in the top of the box as well. The inside of the drawers are felt lined and there is a mirror inside the lid of the music box. The tiny unicorn at the top of music box revolves as music from ‘The Unicorn’ plays. Your little six year old girl will be fascinated watching the little unicorn turn in time to the music. And she will be so excited to explore the compartments and hide away her little bits of jewelry and secret treasures! The artwork and drawings on the outside of the box will captivate her as she imagines and creates the story behind all the images in the scene. Do keep in mind that this music box is not really a toy, but it is an essential item for most feminine little girls of around age 6. Nowadays girls become interested in fashion at an extremely young age and your little one will most likely be no different. If your 6 year old girl is a budding fashionista then this Fashion Plates Deluxe Kit will provide her with hours of fun, creating her very own stylish fashions. 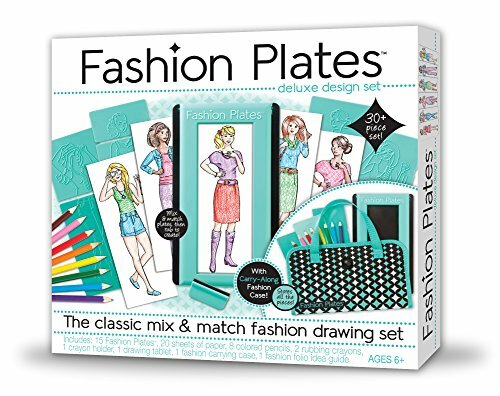 The Fashion Plates Deluxe Kit comes with 15 different fashion plates, 20 sheets of paper, 8 colored pencils, 2 rubbing crayons, a drawing tablet, and a carrying case to keep the entire kit together and neat and tidy. It also includes a fashion idea guide to spark your child’s creative juices. This Fashions Plates Deluce kit is designed to be used for children ages 6 years and up. This is actually a remake of the Fashion Plates Kits that were sold in the early 80’s and that a generation of little girls grew up on. So if you still have the plates from when you were a child, you’ll be pleased to know that they will work with this kit. In order to create the different fashions, your little girl simple loads the different plates (sometimes 2, sometimes 3), places the paper on top of the plate, and then closes the frame to hold the paper in place. Then she uses the rubbing crayon in order to ‘draw’ the outfit that is on the plate. Once the outfit is drawn, your princess can use the colored pencils to color and decorate the different outfits. When the paper in the kit runs out, you can use copy paper or other plain paper to let your little girl create even more fashions! Whether your child has a secret desire to be a fashion designer or simply just like clothes, this wonderful kit can provide her with hours of creativity, allowing her to experiment and design her own fashions.